Xantrex brings the next generation of inverter/charger to market, with the XW Hybrid Inverter/Charger, the heart of the XW System. 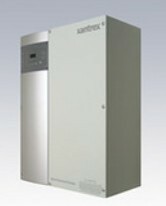 The XW Hybrid Inverter/Charger (XW) is a true sine wave, 120/240-volt AC, split-phase, inverter/charger that incorporates a DC to AC inverter, a battery charger, and an AC auto-transfer switch. Capable of being grid-interactive or grid-independent, the XW can operate with generators and renewable energy sources to provide full time or backup power.